Complimentary Wi-Fi and an outdoor pool plus a location within walking distance to shopping make for a pleasant stay at the Americas Best Inns Tupelo. When not sleeping in watching TV or brewing up some java in the in-room coffeemaker guests can enjoy the seasonal outdoor pool free Wi-Fi property-wide. There's also a 24-hour laundromat on-site a lobby business center and parking is free. The hotel allows one pet weighing 25 pounds or less per room and additional restrictions apply. Located less than five miles from the heart of downtown Tupelo the Americas Best Inns hotel places guests a mile-and-a-half north of I-22 and within a 10-minute walk of The Mall at Barnes Crossing. 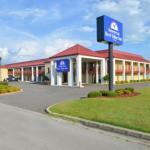 Natchez Trace Parkway is just over one mile west of the hotel and Big Oaks Golf Course is less than 10 minutes east. Tupelo Regional Airport is six-and-a-half miles away.